Spell Check in Excel – Where is it and How to Use it? >> Spell Check in Excel – Where is it and How to Use it? Spell Check in Excel is often ignored given that Excel users often work with numbers as compared with text. But it is still one of the important checks one should have in place. As compared to MS Word or PowerPoint, where you can visually see a red underline below the word that has been misspelled, nothing of that sorts happen in Excel. Imagine a disastrous spelling error glaring out of your worksheet when you sent it to your client. No matter how much hard work you put into data crunching and analysis, all your credibility goes down the drain. In this tutorial, I will show you how to use spell check in Excel and how you can maximize your efforts by the options available to you. You can find spell check option in review tab in the ribbon in Excel. When you click on the Spelling option in the review tab, it opens the Spell Check dialogue box. 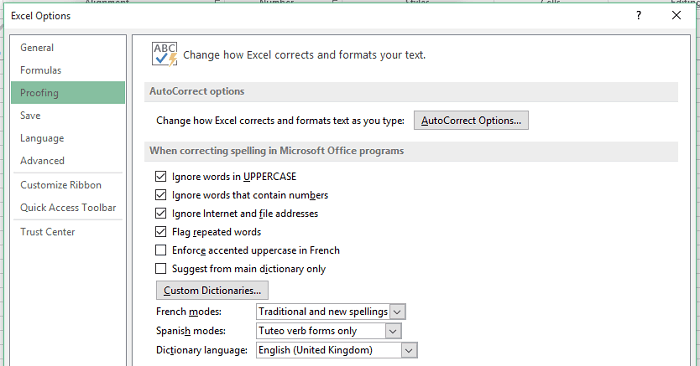 You can also use the keyboard shortcut F7 to run spell Check in Excel. To use this, activate the worksheet in which you want to run spell check, select the cell/range of cells, and press F7 from your keyboard. An important thing worth knowing is how spell check in Excel works. If you select cell A1, it will go through all the cells in the first row, then moves to the second row and check all the cells in the second row (from left to right) and then move to the third row and so on. If it identifies a cell with a spelling error, it displays the Spelling dialogue box. If the user selects Yes, it goes back and checks the remaining cells (which would be A1 to B2 in our example). As shown, when we begin the spell check with A1, it completes the spell check for all the cells. But when we begin with cell B3, it checks for all the cells from B3 and then asks the user if he/she wants to continue checking from the beginning. Ignore Once: If spell check encounters a word it identifies as an error, but you want to keep it that way, you can click on Ignore Once. This will ignore that error once. Ignore All: If excel identifies a word as an error, but you want to keep all instances of that word (as is), click on Ignore All. 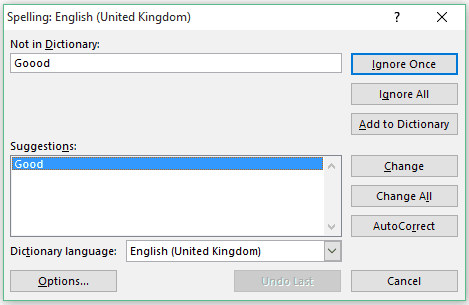 Add to Dictionary: If Excel flags a word as an error but it is the correct word to be used (maybe it’s a name or abbreviation that you use in your company), then you can add it to the dictionary. When such a word is flagged as an error and you click on Add to Dictionary, Excel will make that a part of acceptable words and won’t flag it again. Note that this word is now part of Excel dictionary and would never be flagged in any of the workbooks. Change: When Excel highlights an error, it also shows some suggestions (for example it suggests Good in place of Goood). There can be one or more that one suggestion. Select the suggestion that you want to use and click on Change to apply that. Change All: If you click on this button, it will change all the occurrence of the misspelled word with the selected suggestion. AutoCorrect: Excel autocorrect option will change the misspelled word with the selected suggestion, and also add it to the autocorrect list. This means, that next time you type the same misspelled word, excel would automatically convert it into the suggestion that you selected. 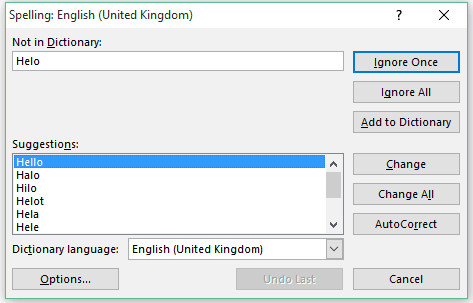 Dictionary Language: You can change the dictionary language using this drop down. It ignores words which are in Upper Case. For example, if you have the word HELLOOO, it will not be flagged as an error. It ignores words that contain numbers. For example, if you have the word Hello123, it will not be flagged as an error. It ignores internet and file addresses. It DOES NOT ignore repeated words. For example, if you have the text – Hello, How are are you? – then it the additional are will be flagged as an error. You can change these default setting by clicking on the ‘Option’ button in the Spell Check Dialogue box. It will open the Options dialogue box where you can make the necessary changes. Hope you found this tutorial helpful. Let me know your thoughts by leaving a comment below. How to Track Changes in Excel. MS Help – Checking Spelling and Grammar. A good spelling tutorial, but there are some grammatical errors: “How Does Spell Check Works in Excel” and “There can be one or more that one suggestion” are two. Very great reminder, I always seem to forget. Cheers!